We have developed a class little program which can send an SMS from an Excel spreadsheet. Our Excel2SMS feature is perfect for reminding a list of debtors or membership renewals. It is super easy to setup and can be done in three easy steps. Open an account with Sendmode or contact [email protected] and he will set up the account for you. Click on the image below to do this. Click on the Settings tab and add your login details. Then click the “Check Login” button and a response will appear in the box. See the image below as an example. The example below shows an SMS to be sent to a list of debtors. It uses the ##CUSTOM1## field as the debtors first name and the ##CUSTOM2## field as the amount owed. Load the mobile numbers, first name and amounts owed in the columns as showed and click “Send SMS”. Each row will return an entry in the Response column showing the SMS has been send for this number. That’s it. 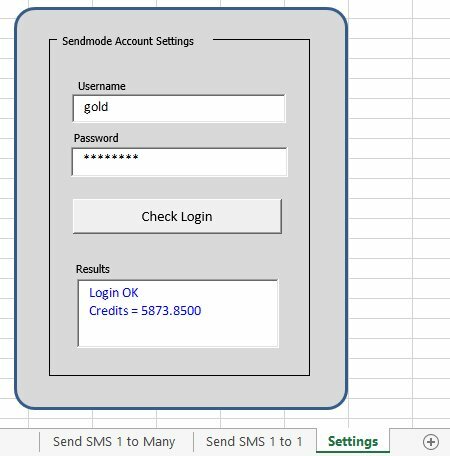 Sending an SMS from an Excel spreadsheet, you never have to login to any website, just load up the data and away you go. If you are interested using this feature, send an email to [email protected] and we’ll get the spreadsheet over to you. Thanks for taking the time to read our blog. We appreciate all your comments and feedback as always.